A huge weekend of running for the club with members spread far and wide at events all around the country; from the New Forest to the North East. Starting close to home we were without Rushmoor Parkrun due to another event using the car park. As a result Frimley Lodge was popular with 682 runners including 15 SJs who were led home by Neil Praine in 19:46 closely followed by Clive Rolfe in exactly 20 minutes. Bracknell was busy with 433 runners amongst them ten Sandhurst Joggers. Patrick Wadsworth was first SJ to finish in 23:55. Looking further afield to members in action in other parts of the UK, we saw a quartet of Parkrun Tourists. Frances and Andrew Parkes ran at Coventry, Lisa Hale at East Grinstead in Sussex and Stuart Overhill celebrated his 150 Parkrun milestone at Gunnersbury in West London (more from him later in the week). 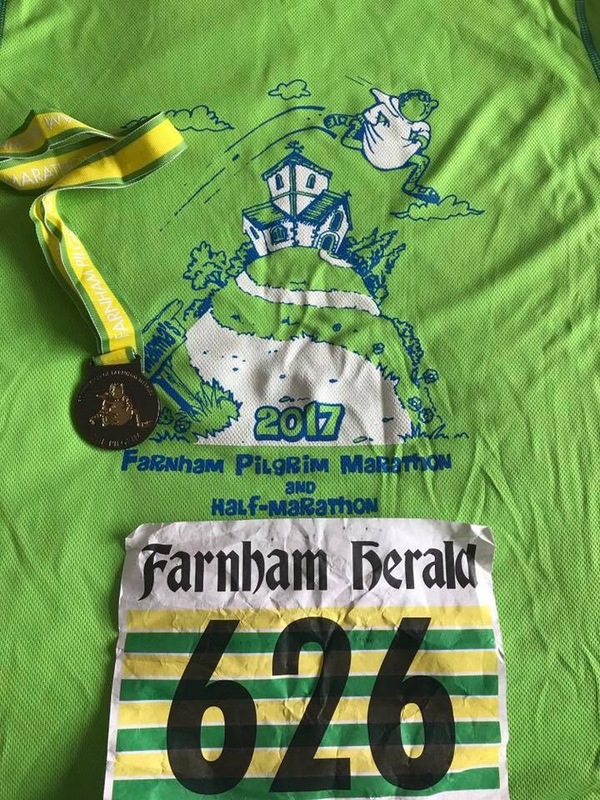 Lots of members in action at the raved about event; the scenic and hilly Farnham Pilgrims Marathon & Half Marathon. 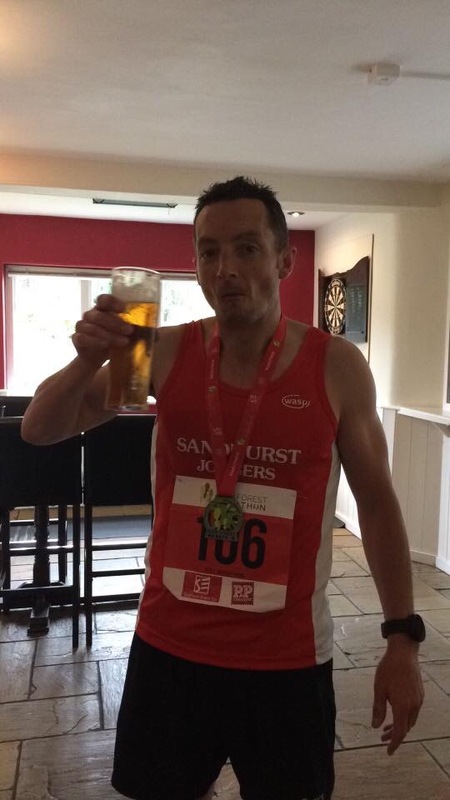 Here are the results of the full marathon with special mention to Martin Gould whose still listed under Blackwater Valley Runners despite being a SJ regular, he finished in 5:22:19. More great results in the half marathon with Gavin Loader producing a superb result for 4th overall! Results for all members are below, with the addition of Katie Herrington who’s chip time was 2:09:02. More SJ endurance action could be found down in the New Forest (and that was just getting to the event though the M3 traffic chaos). Marathon debutante Andrew Brooks overcame injury to post a superb 3:27:56 in his first (and allegedly last) marathon. He was closely followed by Alan Moscrop, with Pam Moscrop also running strongly on the challenging course. Chris Lambourn had a great run in the half along with Dave Bartlett who put injury woes behind him posting 1:55:21 as he supported daughter Abi to a sub-2 hour half. Great runs for Tracy Buck and Debra Harris in the 10k. Over at the Henley 10k, on a challenging course with hills, flat bits, slopes, fields, gravel paths, roads, dirt paths, stiles, kissing gates and to cap it all a five barred gate to climb over! (Thanks to Alurie Dutton for the course description). Fantastic runs from SJ 10k connoisseur Alurie, Yvette Glacken, Jacq Hudson, Lucy Ong and Blanche Barnes. A quartet of Sandhurst Joggers joined 43,000 runners at the Great North Run enjoyed the superb atmosphere the event is renowned for. 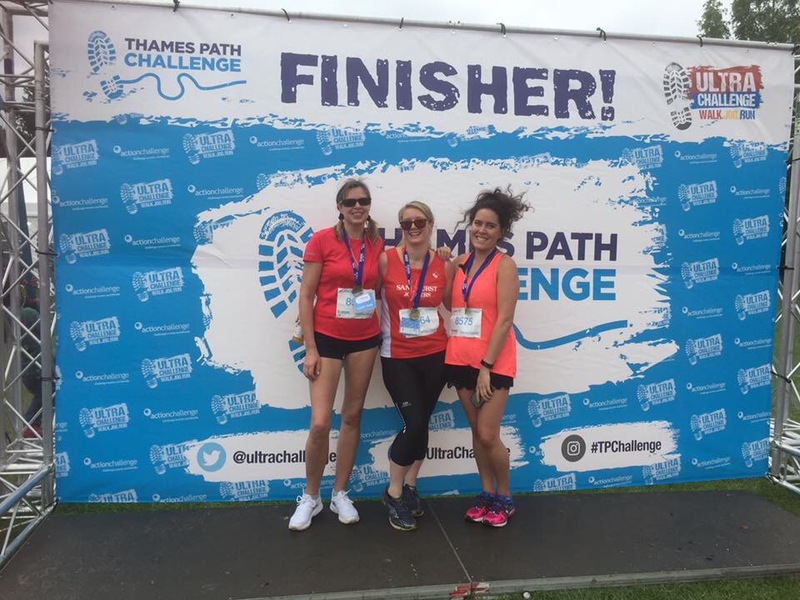 Pam Whelan continued her ‘run’ of runs in the Great Run series. James Ward continued his great run of form with 12th place at the Stockbridge 10k finishing in 42:02. The event was held on quiet roads between Winchester and Salisbury is a hidden gem and one to look out for next year. 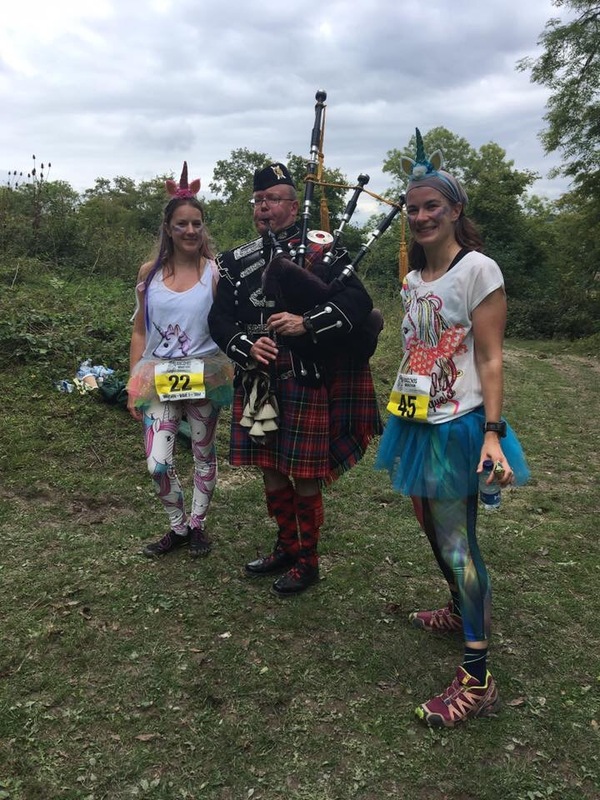 Angela Foker continues to seek out a diverse range of events and this weekend took part in the Colour Bubble Rush near Windsor. 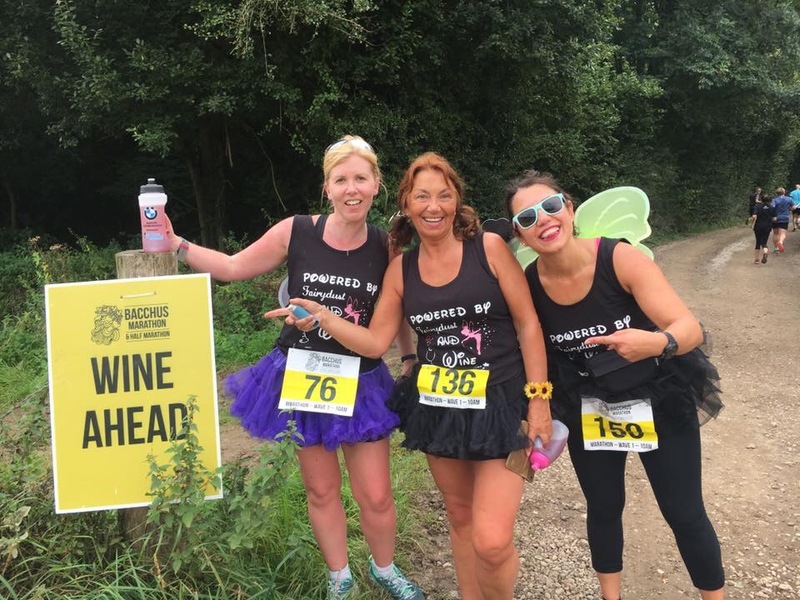 And finally an elite squad of SJs completed the very special duathlon (running and drinking) at the Bacchus marathon at Denbies Vineyard near Dorking. Below are some great pictures which capture the (fairydust) spirit of the event. Amazingly a couple of runners finished in under 3 hours but surely that misses the whole point of the event! Certainly our SJ runners had no such confusion! 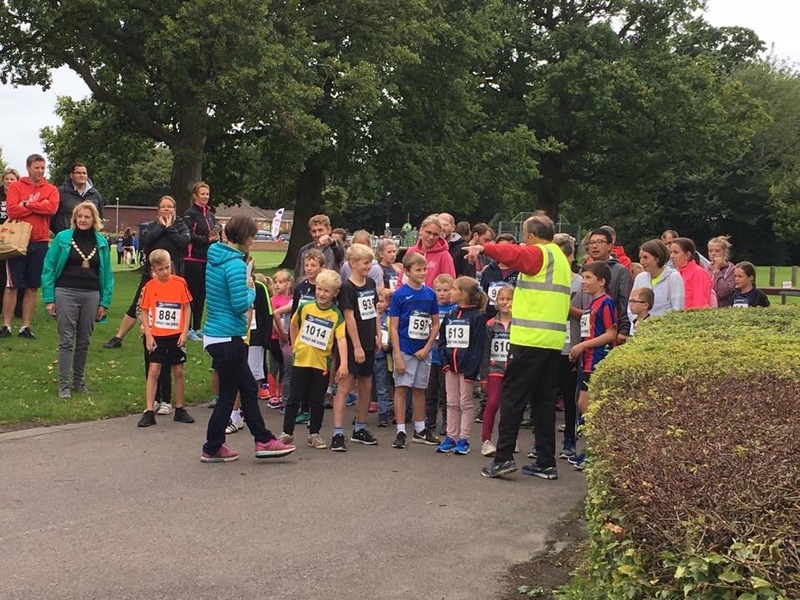 I lied, one more important event to cover… The Sandhurst Fitness Fun Day incorporating the Fun Run hosted by Sandhurst Joggers. Questionable weather conditions certainly didn’t dampen down the enthusiasm and a record turnout took to The Memorial Park. Ian McCready topped the Strava Leaderboard with a mightily impressive 107.7km, Lisa Hale added to her Strava medal haul with silver thanks to 87.6km and Richard Boese took third with 74.1km. Seventy-three members logged runs this week and club activity continues to grow. To take part in this just create a free Strava account and link it to the club in your profile. Thursday: This week the threshold/improvers run will be back on the road, Nikki will have more details later in the week and soon we’ll have a route schedule planned out. Saturday: This will be a big day for the current class of Pure Beginners as they will be aiming to complete Bracknell Parkrun. It would be great if as many members as possible could join them for support and to celebrate their achievements. 9am at South Park, Great Hollands. Sunday: This week we have the 30th Anniversary Round Bracknell Relay. More details on Facebook or check back on the emails from organiser Patrick Wadsworth.